California Supreme Court Justice Mariano-Florentino Cuéllar chairs the Judicial Council's Language Access Plan Implementation Task Force. The five-part video series is available in English, Spanish, Mandarin, Cantonese, Vietnamese, and Korean. 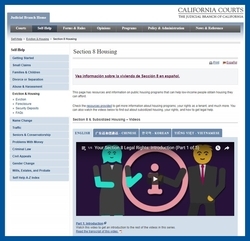 A new five-part video series on Section 8 Tenant Rights is available online in six languages on the California Courts Online Self-Help Center. The videos are available in English, Spanish, Mandarin, Cantonese, Vietnamese, and Korean. California Supreme Court Justice Mariano-Florentino Cuéllar initiated the video project after attending LA Law Library’s Pro Bono Week, where he sat in on sessions that explained complex procedures, systems, and laws in very simple terms. His vision is to convert the presentations into a set of online videos or playlists that can be searched by topic. The first of those topics to be turned into a video series, the Section 8 Housing videos stem from a 1-hour presentation from the LA Law Library. The presentation was cut into 5 short clips (2-3 minutes in length), translated into California's 5 most common languages, and posted on the California Courts Self-Help Center. The self-help website receives more than 30,000 visits every month from legal aid providers, law libraries, community service organizations, and other members of the public. The videos are also available on the California Courts Self-Help YouTube Channel. The video project, known as the Multilingual Online Access to Justice Initiative, is supported by the Legal Aid Association of California and the LA Law Library, and funding is provided by Ana Marshall, vice president and chief investment officer for the William and Flora Hewlett Foundation.